The unexpected almost happened at the Te Puke round of the New Zealand DRD Super Enduro Championships on Saturday. It was only a last-gasp pass that gave favourite Pahiatua's Paul Whibley victory in the 10-rider final. The endurocross has been held as part of the Te Puke A&P Show since 2010 but, this year, a clash with the opening round of the New Zealand Motocross Championships resulted in numbers being down on previous years. "I don't think the long weekend helped us either and there were a couple out riding the previous day who injured themselves and couldn't compete," said organiser and Te Puke Motorcycle Club president Murray Jensen. "But it allowed us to do something different." In the morning's head-to-head three-lap sprint race, Yamaha riders Whibley and Adrian Smith (Mokau) met in the final, with Whibley taking the win. In the afternoon, riders were divided into two groups of seven, each having two nine-lap heats to find eight riders for the final. Two more from a last-chance race brought the final field up to 10. In the final, raced over 12 laps, Cambridge's Dylan Yearbury (KTM) got off to a great start while Whibley made an error on the first tyre obstacle after the water splash, letting him get away. It was only in the final corner that Whibley got his nose in front to take a double victory on the day. The course included logs, jumps, tyre obstacles, a water splash and a section of rough rocks. "We compacted (the course) up a little bit more than we have in the past, but we always like to have something pretty challenging," said Jensen. "There was definitely no rest for the riders." Adding the event to the A&P Show attractions has been a win-win. "It's a great addition to the show and brings in a reasonable number of extra people and for us ... it doesn't work as a stand-alone event but this way it gives riders somewhere to show their enduro skills. "Normally, they are in more remote areas, so most people don't get to see any of it." 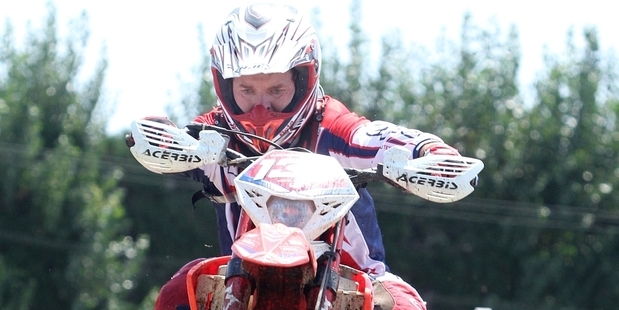 Warren Laugesen, of Hawke's Bay, powered his way to fifth place in the endurocross knockout. Endurocross knockout: 1st Paul Whibley, Yamaha YZ250; 2nd Dylan Yearbury, KTM 250 EXC; 3rd Chris Power, Yamaha YZF450; 4th Adrian Smith, Yamaha YZ250 FX; 5th Warren Laugesen, Beta RR300; 6th Charlie Richardson, KTM 250 XCF; 7th Duncan Summerville, KTM 200 XCW; 8th Jesse Clarke, KTM 200 XCW; 9th Josh Barber, KTM 200 XCW; 10th Tim Salter, KTM 350XCF. Sprint: 1st Paul Whibley; 2nd Adrian Smith; 3rd Dylan Yearbury; 4th Chris Power; 5th Warren Laugesen; 6th Charlie Richardson; 7th Jess Clark; 8th Daniel White; 9th Duncan Summerfield; 10th Shane Singleton; 11th Tim Salter; 12th Murray Jensen; 13th Josh Barber; 14th Jonathan Buck.